Home › Toys › Bundle Of 200: Clear Sleeves: Standard Card Game Pack (50 Sleeves/Pack - 4 Pa.. 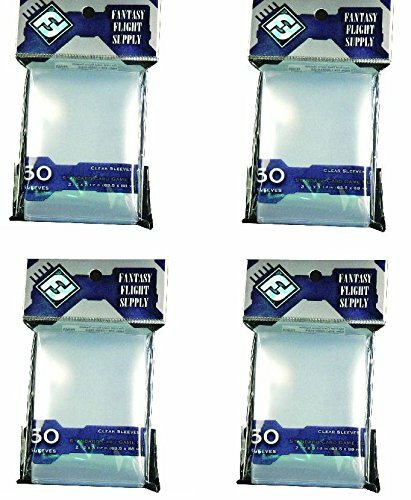 Bundle Of 200: Clear Sleeves: Standard Card Game Pack (50 Sleeves/Pack - 4 Pa..
All sleeves in the Fantasy Flight Supply board game sleeve line are made ofclear, 100 micron-thick, non-PVC, acid-free polypropylene plastic. This meansthat the sleeves are durable, difficult to tear or crease, and are free ofchemicals that will corrode the cards within the sleeves. The sleeves are alsodesigned to fit cards snugly, to make shuffling and handling easy. ...Examples of games with cards that this sleeve will fit: Most trading cardgames, Call of Cthulhu LC, A Game of Thrones LCG, UFS, Pandemic- ... Thechromatic (color) sleeve system represents FFG's proprietary trade-dress toidentify sizes for respective games ... All rights reserved by theirrespective trademark holders.